The Australian National Maritime Museum is an agency of The Australian Government in the Ministry of the Arts, Department of Communications. It is Australia’s first national institution dedicated to increasing knowledge and enjoyment of the nation’s diverse maritime heritage. The museum was opened to the public on 29th November 1991. The museum interprets Australia’s maritime past and present through constantly changing exhibitions, programs and events of every kind, including theatre, festivals, seminars, food and musical events, activities afloat and publications. Axel Stenross made boats and the museum celebrates him, his life and the rich maritime history of Port Lincoln. The museum is an historic house but it is not the grand home of a rich landowner. Finnish-born Axel lived humbly in his corrugated iron complex, as can be seen by some of the walls which are made from tea chests. Axel's home is simple but the museum is 21st century in other ways. For example, touch screens provide access to information on the many vessels which came to Port Lincoln. One of South Australia’s most distinctive museums, it is also an operating slip-yard where small craft are cleaned and painted in among a number of historic vessels now at their final home. Smell the sea and listen to the waves lapping not far from where you stand in the museum. The Ballina maritime museum is dedicated to the preservation of the history of the Royal Australian Navy and the maritime history of the North coast of New South Wales. The museum is operated by volunteers in a building supplied by Ballina Council. The La Balsa raft, along with other items from the expedition, is on display at the museum. Other features of the museum include a reference library of over a thousand books, paintings of warships, hundreds of models of ships of all types and photographs related to the maritime history of the Richmond river and the port of Ballina. The notorious waters of Bass Strait both separate and join the island state of Tasmania to mainland Australia. This stretch of water has always provided explorers, settlers, boat builders, fishermen, yachtsmen and entrepreneurs with challenges. These stories are told in the Bass Strait Maritime Centre in Devonport. There is no other Centre dedicated to the Strait’s natural history, exploration, shipwrecks and human endeavours. Through objects, images and interactive displays, visitors can immerse themselves in the history and our present changing perceptions of intrigue, hardship, tragedy and triumph ‘from the eye of the needle to the edge of the shelf’. Built in 1879 as shipping house and warehouse, using local freestone with sawn Coraline limestone quoins. Beachport Old Wool and Grain Store Museum features displays about the local fishing industry, whaling, agricultural history and the Buandik people. The whaling display includes harpoons, bones and interpretive display panels that tell the stories of Beachport’s whaling past. Other displays include a large group of heavy agriculture machinery, wood working hand tools, a complete collection of electrical insulators used in the Melbourne to Darwin overland telegraph line and an extensive display of rabbit traps. There is a new display (opened 2011) that focuses on the interactions between the Buandik Indigenous people and Beachport’s European settlers. Flinders 1798, and Baudin 1802. The foundation stone was laid on 9th September 1954 to commemorate the 200th anniversary of the birth of Bligh. 26,000 convict made bricks were transported to Adventure Bay for the building. The Eden Killer Whale Museum has been in operation for some seventy five years. The museum is managed by a small, enthusiastic voluntary committee which receives no subsidy for ongoing operational cost. The museum is in a publicly owned facility, situated on a hillside overlooking the Pacific Ocean. The Eden Killer Whale Museum has a diverse range of permanent exhibitions such as 'Old Tom' and the Replica Lighthouse. It also regularly hosts travelling and special in-house exhibitions. Take a step back in time when you visit the Edithburgh Museum. Adjacent to the jetty and situated in the old McGlew & Adams produce store, the museum is often described as the best small museum in South Australia. The Museum's well defined displays include early settlement, the agricultural, commercial, industrial, military, sporting & social history of the area with major emphasis on the salt Industry, from harvesting off the lakes to transporting along the steel track, through to refining & export. Also included is the port of Edithburgh, its shipping and the jetty from the 1870's to the 1930's of this once busy port, and the shipwrecks of the area including a detailed exhibit of the many artifacts from the Clan Ranald which sank off Troubridge Hill in 1909 and claimed the lives of 40 crew members. Flagstaff Hill is an interactive maritime village and museum that takes visitors on a rich journey of discovery through an early Australian coastal fishing port. Scattered throughout this faithful recreation of a late 1800’s port are typical dwellings of the period; a bank, doctor’s surgery, church, foundry, newspaper office, jail, slipway, inn, school, ship chandlers and sail makers loft. Set on 10 acres of land overlooking Lady Bay, the site also features an original fully operational lighthouse and keeper’s cottage built in 1859. Flagstaff Hill has a rich collection of historical relics and artefacts from shipwrecks. Pride of place belongs to the famous Loch Ard Peacock, a magnificent porcelain bird that was headed for the Melbourne International Exhibition of 1880 when the Loch Ard struck Muttonbird Island near present day Loch Ard Gorge. Geelong's early story is of the sea, with passenger arrivals and departures, or trade, scientific and naval activities. Geelong's maritime past sails into view in the renovated stables of the historic Osborne House mansion, overlooking Corio Bay. Displays include typical luggage of an early passenger, scale models of ships that either visited Geelong or called the port home, and relics of the trade and navigation. There is also information on the sea voyages of explorers, settlers and immigrants, wartime naval battles and Geelong’s early maritime history from 1838. Osborne House was Australia’s first Naval College in 1913-14 and then a submarine base from 1920 to 1922. Set in the historic seaside town of Port Albert (est.1841) the Gippsland Regional Maritime Museum is housed in the former Bank of Victoria built in 1862 to receive gold from Gippsland's goldfields. The museum opened in 1976. Significant items dealing with Gippsland's maritime history are housed in the bank building and in the John Irving Archives in the adjacent former CBC bank office. In the entrance room is the 400kg, 1.3m high drum lens from the Cape Liptrap lighthouse and the story of the Bass Strait lighthouses is told in the display on "The Mailmen of Bass Strait". The growth and decline of Port Albert's fishing fleet is outlined in the fishing room display on "The Sharkers of Port Albert". There is also a comprehensive shell collection and the Chinaman's Point diorama and information boards have the findings of a recent archaeological dig at the site of the 19th century Chinese fish curing industry at Port Albert. The Holbrook Submarine Museum is dedicated to the role of the submarine and Commander Norman Holbrook VC. Located in the submarine precinct is HMAS Otway (an Oberon Class Australian submarine), the tail end “Duck’s Arse” and a model of a B11 submarine as used by Commander Holbrook during World War One. Inside the museum is HMAS Otway’s control room, which allows you to walk through and operate the periscope. You can experience commanding HMAS Otway as well as watching DVDs on life on board and visit our Commander Holbrook room where a Victoria Cross replica is on display as well as a hologram that tells the story of Commander Holbrook's and how the town came to be named after him. The museum concentrates on the history of Jervis Bay and district; including early exploration, the timber industry, Aboriginal history, early settlement, lighthouse history, shipwrecks, coastal shipping, whaling history and Naval base history. There are three galleries within the museum. The Lady Denman gallery concentrates on the history of Jervis Bay and district as well as local Koori history. The Surveyors gallery showcases surveying equipment from the 1700s to the recent past. Finally, the Jervis Bay Museum of Science and the Sea gallery houses a collection of unique objects, historical maritime paintings, prints and watercolours with particular emphasis on the Jervis Bay area. The Mannum Dock of River History Museum is located on the banks of the River Murray in the historic river port town of Mannum, South Australia. The Museum incorporates the paddle steamer Marion, the historic Randell Dry Dock and the Mannum Visitor Information Centre. The Historic Dry Dock is listed on the National Estate and is the only dry dock of its type in the southern hemisphere. The dock, built originally as a floating dock, was installed by Capt William Randell at its present site in 1876. The Museum is currently developing a Conservation Management Plan for the dock. This project is being carried out with Commonwealth Government assistance under the Cultural Heritage Program. Adjacent to the Dock is the Museum building which houses displays featuring the history of the Murray River from the time the area was an inland sea, through to the present time. The story of Millicent town and district from pre-settlement times, is told in a large complex entered via the Visitor Information Centre. It includes a shipwreck room. Millicent is famously the site of a court hearing involving many prominent citizens and the charge of looting. In 1876 a barque, the Geltwood, was wrecked on the coast nearby. The next morning saw the beach littered with bodies and cargo from the ship. The locals felt no qualms about pilfering the flotsam and jetsam and a court case followed where they were all acquitted on the dubious grounds that they didn't know that looting from a shipwreck was a crime. The shipwreck room has the anchor from the Geltwood, and tells the story of the wreck. The Polly Woodside, managed by the National Trust of Australia (Victoria), is located in a dock situated in Southbank on the Yarra River in the city of Melbourne. Polly Woodside, a barque, now restored, was launched in 1885. It is docked in an original wooden walled dry dock and gives visitors an insight into the development of the Port of Melbourne. The dry dock was used for the repair and service of ships for over 100 years. The RAN Heritage Centre tells the story of Australia’s Navy through the exhibition of artefacts from the Naval Heritage Collection bringing to the public the rich history of Royal Australian Navy. The RAN Heritage Centre is located within the public access area on the northern end of Garden Island in the middle of Sydney Harbour and is opened seven days per week from 9 30am to 3 30pm. Access is via Sydney Harbour Ferry (Watson’s Bay route) from Circular Quay. The main exhibition is titled Australia’s Navy in Peace and War and is designed to allow visitors through sight, sound and touch an experience of what it was and is to be Navy. Was established by the Newcastle Maritime Museum Society in the 1970’s. This group of enthusiastic people who loved the sea and saw how our community had been shaped by its relationship with the port and coast wanted to see that the stories of their lives were not lost. After decades at Fort Scratchley, the Newcastle Regional Maritime Museum has now become a Maritime Centre as the current Committee works to broaden its scope to creating a research centre and permanent place to share the community’s stories of the sea. Its vision is to see here the ongoing interchange of knowledge and ideas about the past and the future of the maritime industries, the sea and weather that play such a role in what can be done, and our ongoing passion for enjoying the sea and river as a place to relax. The museum documents Portland’s rich maritime history from the arrival of the first European settlers, the Henty brothers, in 1834. The displays are drawn from Glenelg Shire Council’s extensive Cultural Collection, with much of the maritime material donated to Council by the Port of Portland in the 1990s. Situated in the centre of Port MacDonnell, South Australia's most Southerly town, the Museum is housed in the two rooms of the original port MacDonnell Council Chambers. The Museum is filled with historic photographs, informative text and many artefacts, from the time Lieutenant James Grant first sighted this area of coastline from the deck of H.M.S. Lady Nelson in December 1800 to the town's current prominence as Australia's Southern Rock Lobster Capital. Many a vessel has come to grief in the area. The shipwreck gallery tells you the story of some of these. You can see the bell and cannon from the ill-fated Admella, which foundered in 1859 with the loss of all but 24 of her 113 passengers. The Port Macquarie Maritime Heritage Centre (Mid North Coast Maritime Museum) provides a focal point for the research and display of the maritime heritage of this important region of New South Wales. Port Macquarie with its early penal settlement saw some of the earliest explorations of the northern coastline and inland river ways. The areas rich timber reserves meant that Port Macquarie developed into a significant shipping hub. The museum has an important photographic record of the areas maritime heritage, a ship model room and Navy room. The Museum has an interactive boat yard on the river frontage and is involved in historic vessel reconstruction. Cruises can be taken on the ex-Sydney Harbour work-boat, MV Wentworth. The bustling Port of Echuca is recognised as one of Australia’s finest heritage icons. Built in 1865 by the Victorian Railways, the Port of Echuca Wharf was crucial to Echuca’s development. For many years, Echuca was the main shipbuilding centre for the river transport industry. Some of the boats built in Echuca, such as the PS Adelaide, still operate on the Murray River today. At its peak, Echuca supported 8 sawmills and turned over up to 240 paddlesteamers a year. The collection includes a fleet of barges, original river paddle-steamers, railway carriages, locomotives and a selection of allied steam machinery. A museum shed houses a variety of maritime artefacts. Cruises are available on three working steamers. The Port Welshpool and District Maritime Museum is based around a collection of marine items, maritime relics, official documents, photographs and other pieces of historical value. The collection was gathered by William Bruce McGuire Smith and his sons over an 80-year period of professional fishing in Bass Strait. He was the first fisherman to base his activities at Port Welshpool. The building that houses the collection was the first permanent home erected in the township. It was the home of the Smith family for the period of their fishing activities. The paddle steamer Ruby is the Flagship of the Port of Wentworth at the junction of the Murray and Darling rivers. She provides an authentic 19th century riverboat experience. A heritage icon that is being lovingly restored by volunteers as a true community project. She has been rebuilt to her 1907 configuration thanks to the help from her generous sponsors and supporters. In the near future, once a Survey Certificate is issued, it is intended that Ruby will operate as the Flagship of the Port of Wentworth & will provide a training platform for educating mainly young people in such subjects as the environment, flora & fauna & leadership. Commencing in 1980 as the Queenscliffe Lifeboat Preservation Society, the Maritime Museum building was opened in 1986 to display Queenscliff’s last lifeboat. Since then, the Museum has expanded to cover the maritime history of Queenscliff and Southern Port Phillip. In 1998 the name was changed to the Queenscliffe Maritime Museum to better reflect its ever expanding collection. Over the ensuring years a boatshed and many artefacts and historical buildings have become part of the Collection. The Queensland Maritime Museum was founded in 1971 and is run by a self-funded voluntary Association. It is situated on the banks of the Brisbane River at the southern end of South Bank Parklands. 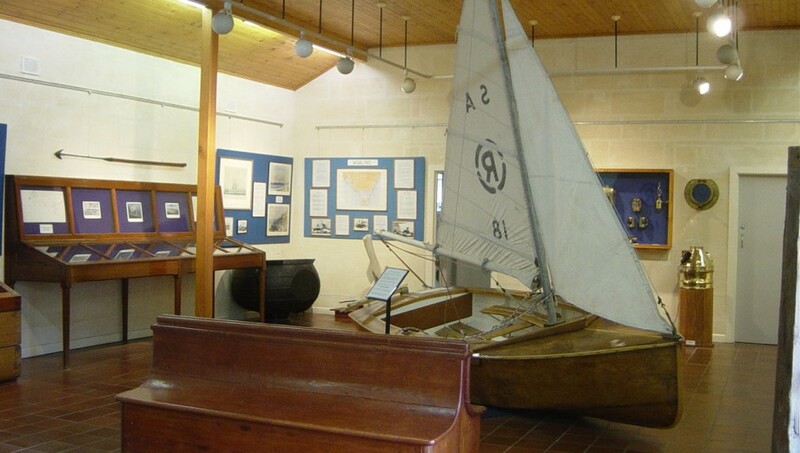 The Museum contains extensive collections of historical maritime artefacts, books, documents and photographs. The collection is displayed to the public in the galleries and grounds of the Museum under the broad headings of Navigation, Lighthouses, Ship Models, Marine Engines, Vessels, and the Dry Dock. The museum carries out research on all aspects of Queensland’s and Australia’s maritime history as well as on maritime matters generally. Robe Custom House was built in 1863 as a customs house to cater for the import and export of produce and material to and from the developing southeast region of South Australia. At this time prior to the railway system all trade came through the coastal ports. Approximately 16,500 Chinese gold miners came through Robe on route to the Victorian goldfields. A military establishment was here to assist in control of the region. Robe Custom House has Chinese artefacts, pictures of the past state governors and explorers like Flinders and Baudin. There is also some shipwreck data together with World War Two information and artefacts from that era. The National Trust Robe Customs House is closed from late July to mid September, visits during this time are by prior appointment only through the Robe Visitor Information Centre. Close to the sea, in Port Adelaide’s historic heart, is the South Australian Maritime Museum. The Museum opened in 1986 to be acclaimed as one of the finest maritime museums in the world. The Museum's collections reflect South Australia's rich and diverse maritime connections and stories. The experience begins at the Bond Stores, home to the Museum’s exhibition galleries. In the 1850s these grand spaces were built to hold goods and cargo. Today, they offer a historical journey of revelation, exploration and stimulation. A community-based non-profit organisation, the Fleet’s mission is to build and maintain an internationally recognised centre of excellence in maritime heritage for the benefit of all Australians by presenting through research, acquisition, conservation, restoration, education and operation, our continuing maritime history. The Fleet’s 1200 strong membership and 650 dedicated volunteer workers restore, operate and maintain the fleet of vintage vessels. In the process they preserve traditional technical methods and skills. 1902 steam tug Waratah the Fleet’s oldest vessel, the 1874 iron barque James Craig, has been fully restored and regularly puts to sea under full sail. The Fleet also operates the 1902 steam tug Waratah, the 1902 VIP steam launch Lady Hopetoun and the 1903 schooner Boomerang. These include the exploits of early explorers, the whaling industry, stories of trading barges and ferries in the everyday life of days now gone, and the central role of sailing ships and steam ships in the export of apples, minerals and timber. Ship building, navigational instruments, shipwrecks, historic dinghies and the proud story of Tasmania’s role in Naval warfare are prominent. In 2001, the museum opened its doors to the public after a year of extensive refurbishment. The resulting 'ship complex' has attracted a great deal of community support. Located on the southern bank of Ross Creek, the boardwalk overlooks the Townsville motorboat and yacht club. The original museum was begun by the Seafarers Association to ensure the safe keeping of local maritime cultural history. It was located in the Pier Master's office between berths 4 and 6 at the Townsville port. To allow for the expanding collection and ease of public access, in 1992 the building was relocated close to the city centre. The Wallaroo Heritage and Nautical Museum has something of interest for everyone and is divided into sections that illustrate Wallaroo's heritage. Originally a Post Office (1865-1910), this historic building houses extensive displays of the copper smelting era which lasted from 1861 - 1923, postal and telephone history, religious and civic affairs, industry, extensive nautical and general local history displays. Located in front of the Museum in Investigator Park is the former 1877 Tipara reef Lighthouse, an outstanding example of early lighthouses. The Whyalla Maritime Museum complex consists of the former HMAS Whyalla, museum building and Australian native plants garden. It was established in 1988 when the first ship built at the Whyalla's BHP shipyards in 1941 - HMAS Whyalla - was permanently landlocked two kilometres from the sea. The museum collection's strength is in World War Two display which tells the story of the four corvettes that were built in Whyalla. There is a BHP shipbuilding exhibition and a display of the natural history and early maritime heritage of the upper Spencer Gulf. There is also information about the shipbuilding process and about the geology and geography of the region, shipwrecks in the Spencer Gulf and marine species. The Maritime Museum at Victoria Quay at Fremantle promotes a new way of experiencing Western Australia's maritime endeavours. With new galleries and top quality facilities the New Maritime Museum delivers a world class Museum on Western Australia's doorstep. Also at Victoria Quay is the decommissioned HMAS Ovens for visitors to explore. The Shipwreck Galleries at Cliff Street show Australia's earliest shipwrecks, and house world-recognised archaeology research and conservation. The famous Batavia Gallery is the main attraction of this Museum.